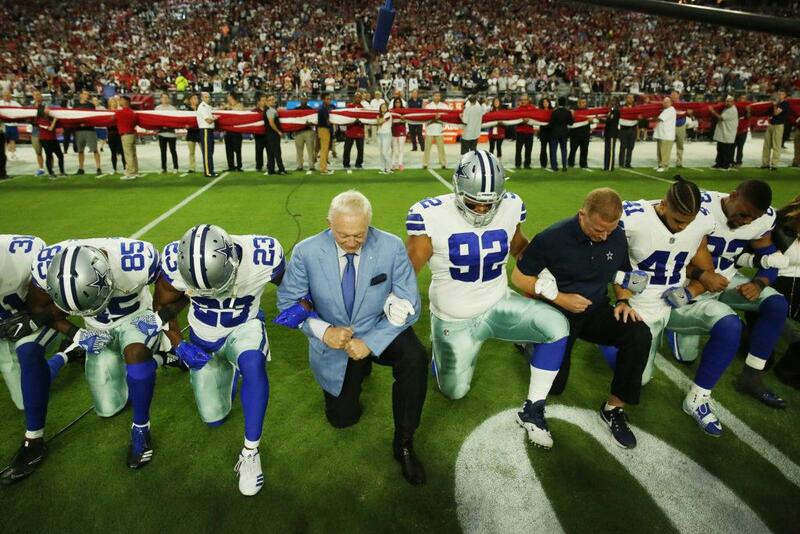 Never have I seen in my lifetime have I seen anything like what the NFL displayed on Sunday and Monday. Owners, Players, and Coaches either kneeled during the national anthem, locked arms, or didn’t leave the locker rooms for the anthem at all, but what was the real reason behind this? It took President Donald Trump to call football players S-O-Bs at a rally in Alabama for the NFL to come together as one, but where was this solidarity last year When Colin Kaepernick took his knee? Credit goes to players like Malcolm Jenkins, linebacker Brandon Marshall, and the Bennett brothers who have always shown support for Kaepernick, so this goes out to the owners. All of this talk about protests and the national anthem and are taking away from the real reason why these black players were kneeling in the first place. None of this is about a flag or a national anthem. It shouldn’t even be about Trumps’ comments, especially since this isn’t the worst comment the President has made since being sworn into office. Tell me why NFL owners didn’t condemn Trump when 2 years ago, as he went down the mall escalator, he calls Mexicans killers and rapists. Why did these NFL owners refuse to turn their back on Trump after his “Both Sides” fiasco following the happenings in Charlottesville, VA. I find it very interesting, as Jacksonville Jaguar’s owner Shahid Khan took a knee with his team on Sunday in London, that he donated $1 million dollars to Trump’s inauguration. How about Dallas Cowboys’ owner, Jerry Jones, who also donated to President Trump? He took a knee with his team prior to the national anthem on Monday. He actually told his team to stand for the anthem, which is why not one player from the Cowboys actually knelt during the anthem. Fox Sports 1’s Rob Parker said, “I was embarrassed for the black players who took part in a fake protest that was all about Jerry Jones. Jerry is the one who could go back to his country club and win the bet that his players were kept in line.” While I don’t believe that is in Jerry Jones’ character, I do know these NFL owners are not so upset at President Trump for his SOB comments so much as they do not like being told what to do, especially as it pertains to their money. Please don’t get distracted by all this talk about the protest and national anthem. Don’t forget about the real issues Kaepernick took a knee for in the first place.